Thank you Tom and Miracle Method! I will recommend you to others! Thank you for sharing Karen, we appreciate your great review! I would love to have the grout sealed. That not only looks nicer, but it is easier to clean. Sign me up. I am way down for a clean nice looking shower. 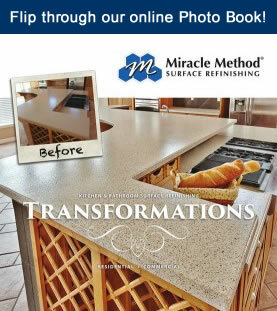 Thank you for your interest in Miracle Method, we can repair and refinish your shower. To obtain a free estimate contact the franchise nearest you. You can find their contact information on our website. Go to http://www.miraclemethod.com and click on “Find Your Nearest Miracle Method” or you can reply with your zip code and we’d be happy to provide the contact information for you. Have a great day!